Creative industries (CIs) deserve an ever increasing interest in recent years. Opportunities of economic wealth, growth and jobs creation at local level are identified as key factors (Henry, de Bruin, 2011; Piergiovanni et al., 2012) and recent research has been developed specifically on the strategic and economic dimensions of CIs and their business models (Throsby 2001; Howkins 2001; Benghozi, Paris 2007; Lyubareva et al. 2013). Several papers highlight the innovative dimension of CIs. Yet the papers dealing with such issue are all thinking about innovation as a means to develop new creative contents. One very important issue is surprisingly neglected: this is the characteristic and the management of R&D in CIs, especially in the cultural sector. Even the few studies that aim at investigating the potential of R&D to support the CIs do not provide any analysis of the processes and/or technologies adopted. The general absence of investigations on R&D activities in the CIs is due to a biased vision of the real relevance of these assets for creative companies. In other words, the main reason for poor investments in R&D is usually linked to the specific size, skills and capitalization of creative companies. Actually, disruptive technological innovations come from outside and creative firms are not really able to control their evolution. Creative firms conceive the new product development as the development of innovative content and never as technological R&D activities. Consequently, the main disruptive innovations in the CIs have always taken place outside these industries: this was the case for sound movie, for instance, invented by General Electric in the early XXth, for the innovative devices in music (K7, Walkman or CD), created in the 70s and 80s by Philips or Sony, and more recently, for the MP3 and Appstore in music. Within this context, our research perspective aims at understanding where R&D actually takes place in CIs, how the articulation is made with content and development projects, which economic actors are taking charge of it, where they are located in the value chain, how they are articulated with content producers. We have decided to focus on the book publishing sector, one of the most prominent CIs sectors. In recent years it has experienced many innovations due to the diffusion of the Internet and ICT (Guiry et al., 2012; Ronte, 2001). Traditional books are confronted with the emerging e-books (cf. Howard, 2009; Dacos, Mounier, 2010; Greco, 2011). Actual policies and/or R&D strategies in this sector call for new analysis since publishers conceive their editorial strategy in order to adapt their content to the new digital demand and available devices rather than investing in the technological development and the design of the technology architecture. Moreover, the transformation process of a traditional editorial house in a digital one has not still been investigated in terms of evolution and changes in the production chain and the editorial tools as well as the investment strategies adopted in the R&D. According to the European Commission report (2005, p. 94), innovation in the publishing industry tends to be incremental, like low-cost high-quality colour printing for books, rather than radical, like the e-book or the audio-book that aim to create entire new markets. The Internet and ICT have prompted publishers to develop and launch online products and services and this incentive is more and more intensified as ICT are constantly evolving. New initiatives like online platforms are fostering publishing industries to integrate into their offerings new content applications in the form of communication technologies and not only information or content technologies (European Commission, 2005). From the more distinctive technological perspective, the book publishing industry has gone, in recent years, through various developments (Simon, de Prato, 2012). According to Hsieh et al. (2011, p. 206), the main e-book technology milestones can be identified as follows: Content (information), Composer (software necessary to create an e-book), Container (the distribution medium and/or file format), Storage, and Access (the technology and software used to provide access to the content). Formats and printing, in particular, have been characterized by several technological revolutions in rapid succession (Cercone, 2009). While the relationship between print and publishing houses has historically been very strong, publishers have become progressively autonomous in relation to printing and bookshop industries (Rouet, 2007). Publisher industry needs intangible investments, flexibility and customization, while technical equipments of graphic industries are always under the challenge of concurrence and modernisation and the need to work at full capacity. Publishers and printers are linked through a relationship of specialisation in terms of collections, formats, kind of paper, and with the aim of reaching an optimum result of quality-costs-delays (Rouet, 2007; Gaymard, 2009). In order to identify technology and R&D phases, it turned useful to elaborate a mapping of the R&D ecosystem of the book publishing industry through a methodical codification of the various investments made by creative firms, of the partnerships created and the technological developments adopted. The cartography of the value chain in the e-book publishing sector started from an analytical coding of the main characteristics of all the versions of the most diffused e-readers and tablets. In particular, the different versions of Kindle, Kobo and Nook e-readers have been explored. Starting from a deep analysis of all the main features of the different e-reader versions, all the specific technologies that influenced the characteristics of these e-readers have been identified and investigated in details. The e-book value chain has been built in a chart structured in six main structural and technical layers adapted from the classical Open Systems Interconnection (OSI) seven layers reference model, used in telecommunication and Internet economy (Zimmermann, 1980). This model portrays the architecture of the industry assuming a hierarchical vertical division of the technical layers. Each consistent layer is considered to be ruled by technological specificities characterizing technological concerns, investments, skills, industrial companies, economic models and clients’ perspective. Level 1 focuses on the operating systems standards: the starting point is the introduction of e-ink technology and electronic paper displays (EPD) between the end of the ‘90s and the beginning of the 2000s. These technologies are linked to Level 2 that is focused on hardware and technology of terminals: e-ink technology influenced digital printing and the emergence of the first tablets, e-book readers and personal digital assistants (PDAs). Several formats succeeded one after the other till the prominence at international level of e-pub and pdf formats. Recent improvements are identifiable in the attempt at creating augmented books with additional properties like optical reader-embedded pen and audio-books. Level 3 is focused on standards and software: blogs and social networks like Facebook and Twitter, and the diffusion of publishers’ platforms, consortia and partnerships are impacting and influencing the infrastructures and networks linked to the connection to consumers (Architecture of infrastructures and networks, Level 4). Print on demand (POD), digital aggregators, digital libraries, distribution platforms, are some key examples. Level 5 (Middleware) is focused on the tools structuring economic relations and exploitation rights. It includes, in particular, those against piracy like digital rights management (DRM) and digital object identifiers (DOI). Finally, Level 6, dedicated to users’ interfaces and ergonomy, identifies the main work in progress like 3D e-books and environmental consequences of toxic substances for e-reader production. These various layers help to understand the technological structuring, the articulation and interrelations between the various levels of the value chain, as well as the distinctive partnerships, investments and strategies implemented by the numerous actors. The different layers show autonomy of the corresponding dynamics. They enable also to better understand where and how publishers invest. The main results highlight that e-books have the aim to imitate the look of physical print on paper. The main concerns are about a reduction of energy requirements in order to gain more autonomy, and e-readers are looking for flexible technologies adapted to various surfaces. The e-ink’s technology revolutionized the e-readers world. They became lighter, more compact, and easier to read with increased and/or more displayed screen sizes (Level 1). The wide range of different versions of tablets and e-readers caused emerging price concerns. Competition and strategic concerns about matters like memory size, interoperable formats, sound, enhanced books and book-apps, have become a matter of fact: new e-readers are constantly improving the battery life and the capacity to hold more and more information with expandable memory (Level 2). As a consequence, industrial marketing viewpoints and usage concerns emerged as key factors. Interactive technologies originated the need to develop specific skills and interactions with consumers through social networks and to consolidate a competitive position through partnerships and consortia (Level 3). 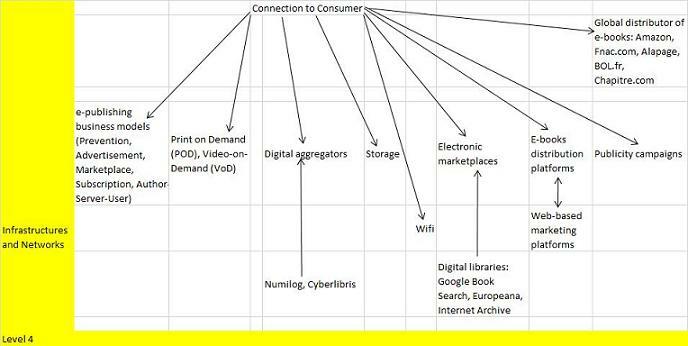 The market design and setting mobility policy for connection to consumers are characterized by distributing contents within collective platforms, promoting and marketing initiatives, and the Print on Demand diffusion (Level 4, see Figure 1). Notwithstanding, economic and piracy concerns are influencing the actual structure: encryptions, DRM, DOI, are only some examples (Level 5). Last but not least, a marginal incorporation of consumer attitudes can be observed: accessibility for disabled, green technologies adoption, innovative business models are still open matters (Level 6). What is, in fact, still missing is a real publishers’ business model for the e-book: it seems that editorial houses are following the market needs without playing an effective role of leaders. As a consequence, investments in R&D and innovation are not linked to the creation of a real business model, but mostly to visibility. This means that the actual editorial strategy is focused more on maintaining the secular place and role of the publishers in the book value chain through an adaptation-imitation process rather than updating their role and functions to the new emerging, instable environment and changing cultural habits. This raises question about the durability of this fragile system and about who is taking the leadership role. R&D and innovation are somehow leading this evolutionary process but publishers are not really well aware of this aspect as they seem not to have the willingness to build a model for using effectively and efficiently these innovations. The digital revolution has had a later and less severe impact on the digital publishing sector compared to the music and cinema industries, where several changes happened in a brief time (Patino, 2008; Gaymard, 2009). Publishing has usually been a low growth business (Ronte, 2001), but in recent years something has changed radically this industry (OECD, 2012). Technology has had an unusual disruptive impact on publishing (Carreiro, 2010). But all these changes are happening under a slow revolution. The first attempts at introducing e-books failed because of their weight and cost (Patino, 2008). The main change happened when new materials were tested and implemented in new e-readers. The digital revolution supports, therefore, disruptive economic change in the publishing sector: it changes the traditional business model of printing, it lowers entry barrier to incomers such as technological suppliers, it gives a key role to new distribution channels such as aggregation platforms. This is, consequently, the very new and prominent role of R&D and innovation which is at stake and might call for an alternative strategy from editorial houses. In recent years new particular forms of cooperation are also emerging: partnerships and consortia in the form of business ecosystems have been created for applying open innovation among several companies working together in order to advance on new innovation axes (Mussinelli, 2010). Nonetheless, the absence of practical and implementable solutions emerges. The printed book is an astonishing model: mobility, the presence of an index as a search engine, a semi-open system (it is possible to write on it and turn pages), a perfect autonomy (no source of energy is necessary), possibility of usage everywhere, instant and definitive ownership from the time of purchase (Patino, 2008). An e-book, instead, is an emerging and still not well defined model, that requires new technical skills and know-how, specialized software expertise, management of new commercial relationships, new methods of digital marketing and distribution, new negotiations and networks (OECD, 2012; Guiry et al., 2012). The description of the six layers highlighted that the revolutionary aspects brought by the Internet and ICT are impacting all the phases of the book publishing value chain (Ronte, 2001). Publication, distribution, sale and reading are changing. The passage from physical to digital distribution, the zero marginal cost of producing an additional book, the emergence of new intermediaries, the many competitors entering this industry thanks to the digital technologies, the problems linked to electronic security, are only some of the characteristics of this revolution. Publishers tend to take the role of content brokers and aggregators who cooperate with other actors (Jha et al., 2010). According to Dacos and Mounier (2010), the practices of collaborative elaboration of contents changed the very notion of book chain. The book is now an object resulting from the joint work of several actors with different professional specialisations, but the different actors work in networking with new cooperation models instead of coordinating the work on a unidirectional production chain. This is possible because of the technological peculiarities of digital text, meaning the infinitely rewritable characteristic of electronic texts. Notwithstanding, firms merely consider R&D as something related more to investments in projects and contents rather than directly referring to the design and innovation on processes, infrastructure and devices. As a consequence, innovative advancements are limited. The reconstruction and map of all the specific phases of the R&D value chain in a specific creative sector like the book publishing one, enabled to understand where the technological innovation actually takes place, and whether creative companies have a perception of what really R&D means or not as well as to understand how and where the R&D activities someway matter. It seems that the e-book diffusion has fostered publishers to an increased attention towards appropriateness of R&D and technological innovation: the revolution in printing, formats, e-readers, tablets and PDAs, are at the origin of several changes in the publishers’ strategy and new investments. As a consequence, publishers are defining and implementing new commercial strategies but all these strategies are depending on the new technologies demand without a leading position of editorial houses. They are focusing on some particular aspects and, therefore, could not be able to adopt a global reactive strategy against competitors and incomers: global editorial projects as well as effective business models are missing. To sum up, digital libraries, publishing-related community blogs, social media and social networking sites are emerging as key tools for attracting new clients and fostering the diffusion of e-books (Carreiro, 2010; Tian, Martin, 2010). Collaborative e-book distribution platforms created by a consortium of major publishers and coproduction agreements among publishers and developers who specialized in the area of new technologies are other key tools (Mussinelli, 2010). But the effective role played by publishers is not emerging as a pivotal factor. In conclusion, the actual main problem is linked to the absence of investments in technological development focused on an effective business model. Publishers are adapting their editorial strategy to the succeeding new digital demand needs, but they are not leading this evolving process with a convincing strategy. The general lack of significant investments in R&D of creative companies gives an echo to the absence of specific studies on the management of R&D in the cultural sector (Green et al., 2007). One of the reasons explaining the poor investments in R&D may of course be linked to the general size of these companies, therefore with difficulties in financing R&D activities. Moreover, our results suggest that the main motivation seems to be that companies in the CIs sectors are considering that they take already so much commercial and aesthetic risk by creating new content that they cannot take in charge additional technical risks and therefore prefer to appropriate the R&D results coming from other industrial sectors instead of investing directly in R&D projects. (1) An extended version of this paper has been presented at the XII international conference on Arts&Cultural Management (AIMAC), 26-29 June 2013, Universidad de los Andes, Bogotá (Colombia) and at the XI international conference TripleHelix, 8-10 July, Birkbeck and UCL, London. Henry C., de Bruin A. (2011), eds, ‘Entrepreneurship and the Creative Economy: Process, Practice and Policy’, Edward Elgar, Cheltenham.